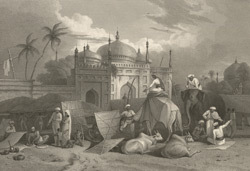 This etching was taken from plate 13 of Charles D'Oyly's 'Antiquities of Dacca'. According to author James Atkinson, this souk or marketplace in Dhaka, "is very ancient, and is situated in that quarter of the city which is now known by the name of the Old Neckaus. It was founded by Moorshed Ally Khan, and forms a square of about 200 yards; where fruits, vegetables, trinkets, toys, sweetmeats &c. &c. are daily exposed for sale. At sunset the inhabitants assemble here in crowds ... the stately Mosque [The Husseinee Delaun] which appears beyond the market ... was built in the year 1676." The Hussaini Dalan survives to this day: an important centre for the Shia community, from which the Muharram procession takes place annually.